OWNER 11529, you will love this home! Our Hidden Creek Canyons townhouse has a beautiful creekside location along the golf course. Relax in front of fireplace and watch the lift go by! Options for access: Frostwood lift is behind us, Cabriolet is across the street. Bus stops out front. Main Street Park City and Deer Valley are minutes away on the free Park City bus. You will be nestled among the trees bordering the creek near the base of Utah's largest ski resort. If you are looking for a true mountain experience, gaze out the windows and enjoy the peaceful views-this is a lovely getaway yet close to everything. Guests comment on this perfect location and the care and detail we have put into making our townhouse a special place to enjoy. Both the king bed master bedroom and the queen bed guest room have flat screen TVs. The spacious twin-bedded loft bedroom has a high ceiling, skylight and beautiful armoire. 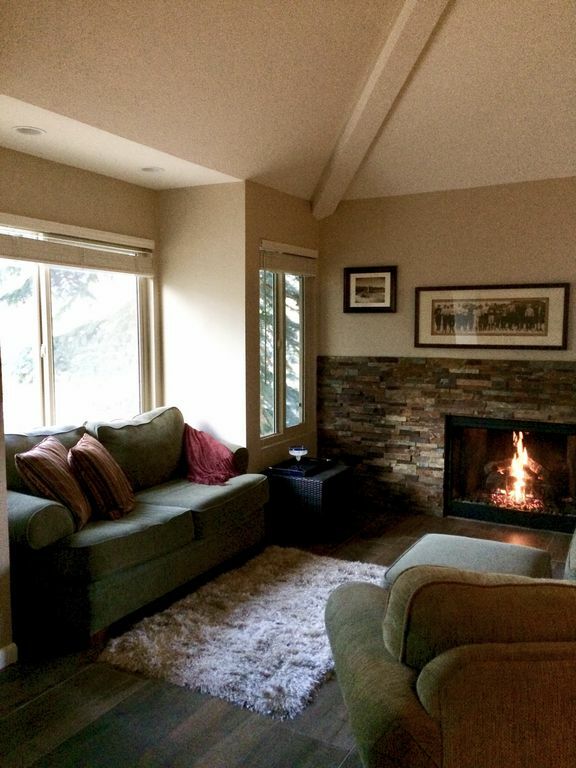 The living room (w/flat screen TV) is split level, giving you plenty of space to relax in! Experience this lovely mountain condo, within steps of the Park City Canyons Resort. Snowshoe outside the door along the creek or build a snowman. Enjoy this real mountain feel with lots of trees, open space and wonderful fresh air! We welcome you to enjoy your trip with all the comforts of home. We are outdoor people and love Park City year round! There is lots to do to keep everyone entertained. The family learned how to ski in Park City years ago, and have been enjoying all the resorts ever since. Skiing, snowboarding, hiking, mountain biking, running, and a great golf course steps away makes for a whole lot of fun. We enjoy the Park City markets, art festival and looking at the big blue skies and beautiful vistas. Park City is our favorite escape from it all destination! When we found this townhouse we knew it was for us. We wanted a break from city living, be able to step out the door and feel nature! Parts of the year it seems like a treehouse. It's peaceful listening to the creek and watching the birds come to the feeder on the deck. It's relaxing at the end of the day to watch the lift go by and watch the last of the skiers and snowboarders come down the mountain, and the rest of the year watch golfers on the green and take odds on the ball falling or not, into the creek. The best part we think, is when we want a town fix, it"s so easy to take the bus into town and later come back home to all of this! Everything needed for a home away from home. SHARED HOT TUB IS UNDER THE STARS! Very nice and cozy condo in a great location ! Everything was very nice, clean and convenient ! Loved the cozy fireplace and comfy chairs. Along with the beautiful location that was easy to ski back to. Excellent and detailed communication with the owner. We will be back next year ! Great spot/location. Comfortable with easy access. So easy to walk to slopes and ski home. Slightly longer walk to the hot tub but take that with the easy access to the slopes! We had a wonderful stay here! The condo was very clean and well stocked with everything we needed. It was very comfortable and we loved relaxing by the fireplace at the end of the day. The owners were very organized and responsive to any questions. The location was perfect as well. We would definitely stay here again! Had a great time on ski trip. Our family of 5 had plenty room. We spent 7 nights and had a great experience. Loved the heated blank. Only a 5 to 10 minute walk to lift. There was enough snow that we took off our skis right at the front door at the end of the day. Would stay here again. Our family of 4 had plenty of room in this spacious property- our teenagers loved the loft and media area, while my wife and I could relax on the base level when we weren’t skiing or seeing the local sights. The property is conveniently located close to Canyons ski area and village; 5 minutes from Kimball Junction (tons of shops, restaurants, etc) and 10 minutes from Main Street Park City. The property owners are very thoughtful and leave no base uncovered in terms of the functionality of the property- other than the food you bring yourself, you don’t need to bring anything else. We would definitely stay here again and will recommend this property to any friends or family we know are visiting the area. Use Park City free bus transportation for Deer Valley, Main Street dining & shopping, visit Factory Outlet mall, Kimball Junction shops & restaurants, Main Street art galleries, Sundance film festival venues, walk to spa at Waldorf etc. This townhouse is non-smoking, and no pets are allowed.